The franchise joined the NL in its eighth season in 1887 and was competitive from its early years, winning three NL titles from 1901 to 1903, playing in the inaugural World Series in 1903 and winning their first World Series in 1909 behind Honus Wagner. The Pirates have had many ups and downs during their long history, most famously winning the 1960 World Series against the New York Yankees on a game-winning walk-off home run by Bill Mazeroski, the only time that Game 7 of the World Series has ever ended with a home run. They also won the 1971 World Series, led by the talent of Roberto Clemente, and the 1979 World Series under the slogan " We Are Family", led by "Pops" Willie Stargell. After a run of regular-season success in the early 1990s (winning three straight East Division titles), the Pirates struggled mightily over the following 20 years, with 20 consecutive losing seasons from 1993 to 2012—the longest such streak in American professional sports history  before posting a winning record in 2013 of 94–68, qualifying them for the NL Wild Card. They advanced to the NL Division Series round, where they lost in 5 games to the St. Louis Cardinals. The Pirates made the playoffs in both 2014 and 2015, losing in the Wild Card Game both times. The Pirates currently have the longest World Series appearance drought in Major League Baseball among any team with at least one appearance,  their most recent showing being their victory in the 1979 Series. Before the 1890 season, nearly all of the Alleghenys' best players bolted to the Players' League's Pittsburgh Burghers. The Players' League collapsed after the season, and the players were allowed to go back to their old clubs. However, the Alleghenys also scooped up highly regarded second baseman Lou Bierbauer, who had previously played with the AA's Philadelphia Athletics. Although the Athletics had failed to include Bierbauer on their reserve list, they loudly protested the Alleghenys' move. In an official complaint, an AA official claimed the Alleghenys' signing of Bierbauer was "piratical". This incident (which is discussed at some length in The Beer and Whisky League, by David Nemec, 1994) quickly accelerated into a schism between the leagues that contributed to the demise of the A.A. Although the Alleghenys were never found guilty of wrongdoing, they made sport of being denounced for being "piratical" by renaming themselves "the Pirates" for the 1891 season. The nickname was first acknowledged on the team's uniforms in 1912. In 2013 the Pirates became the seventh MLB team to reach 10,000 all-time wins. On Opening Day 2015 the Pirates' loss to the Cincinnati Reds represented the team's 10,000th loss,  making the Pirates the fourth MLB team to achieve this distinction, following the Philadelphia Phillies, Atlanta Braves, and Chicago Cubs. Their victory over the Colorado Rockies later in 2015 on September 24 marked the team's 10,000th win as a member of the National League. First franchise to win a World Series on a home run ( 1960 World Series) in the 7th game. The only other team to meet this feat is the Toronto Blue Jays in 1993, though they accomplished it in game 6. Despite having some notable fans including former part-owner Bing Crosby, Michael Keaton, and Regis Philbin,  the Pirates are considered by most to be a distant third in Pittsburgh behind the Pittsburgh Steelers and Pittsburgh Penguins in popularity among Pittsburgh's three major professional sports teams. However, due to their long history in Pittsburgh dating back to the 1882 season, the team has retained a strong loyal following in the Pittsburgh region, especially among older residents. Upon the team ending their 20-season streak with a losing record in 2013, the fan support for the club has grown once again but still remaining a distant third behind the city's other 2 more relevant sports franchises. On October 1, 2011, Clear Channel announced that they will not renew their deal with the Pirates. It was speculated that the club's radio broadcasting rights would likely be transferred back to CBS Radio via FM sports radio station KDKA-FM,  which became official on October 12. On March 2, 2016 it was announced a new deal was reached for the Pirates to remain on KDKA-FM. As part of the deal, KDKA (AM) airs any games that KDKA-FM can't air due to conflicts with Pittsburgh Panthers football and men's basketball. Games are televised on AT&T SportsNet Pittsburgh, the Pirates' cable television outlet since 1986, when it was known as KBL. During the 2016 season, the Pirates averaged a 7.22 rating and 83,000 viewers on primetime TV broadcasts. Apart from any Pirates games aired nationally on Fox, there has been no over-the-air coverage of the Pirates since 2002, when some games were on WCWB. KDKA-TV aired Pirates games for 38 years (1957–1994). Games aired on WPXI (1995–1996) and on WPGH-TV and WCWB (1997–2002). Announcers Greg Brown, Bob Walk, John Wehner, and Steve Blass shuttle between the radio and TV booths. After the departure of play-by-play announcer Tim Neverett, who accepted a play-by-play radio position with the Boston Red Sox  following the 2015 season, former Milwaukee Brewers announcer Joe Block began Play-by-Play Duties beginning with the 2016 season. Former Pirates closer Kent Tekulve, a member of the team's 1979 World Series Championship team, served as a post-game analyst for the team on AT&T SportsNet Pittsburgh. Tekulve announced his retirement at the end of the 2017 season. In 1976, the National League celebrated its 100th anniversary. To coincide with it, certain NL teams wore old-style pillbox hats complete with horizontal pinstripes. 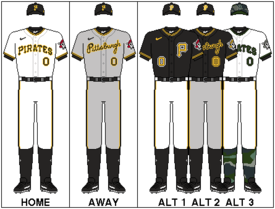 After the season, the Pirates were the only team to adopt the hats permanently, (alternating between a black hat and a gold hat for several seasons until keeping the black hat in 1985) and kept the hat through the 1986 season, which would be Barry Bonds rookie season with the team. The hats, which recall the team's last World Series championship season ( 1979), remain popular items in the throwback market.